The Anxiety of Negation in Marcuse. Or On the Foundations of his Social Philosophy. 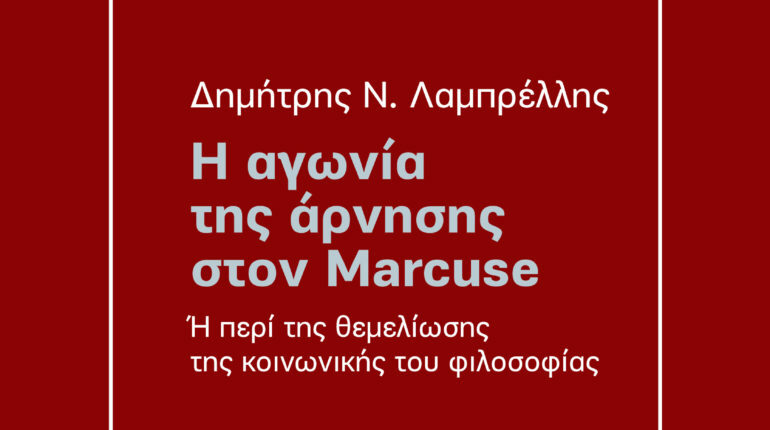 What does it mean that the anxiety of negation consists the foundation of Marcuse’s social philosophy? What does it already mean that negation consists the foundation of a social philosophy? In order to answer these questions we must first answer the most primal one: what does negation mean in Marcuse? And how does the thought of negation in the same philosopher emerge as an anxiety of negation? In order to answer this critical question, in this study we search all those issues that consist causes and modes of the anxiety of negation; causes such as: the attempt of establishing negation as anxiety, the absence of negation within the Advanced Industrial Society; modes such as: the risking of the Great Refusal qua extent (from Negation to negations) and qua tension between the individual and the universal. It is also examined the utmost attempt that concerns the anxiety of negation which is the risking of the universal; this risking marks the transition from the problem of Great Refusal to the problem of Great Risking, taken primarily as revealing and accepting participating into the play of the anonymous aspects of the indefinite other, for the sake of liberation. This risking of the universal that moves far beyond the anxiety of negation (whose limit is the non-risking of the universal), this participation into the Great Risking, is not just another conceptualization-abstraction, namely, another aspect of philosophy about / in favour of difference but an acceptance of participating into the play of revealing the other, an acceptance which is attempted to be achieved through the aesthetic retreatment of philosophy in favour of the concrete. This exodus of philosophy towards the aesthetic, in favour of the concrete, allows to the concrete-difference to be released, free of philosophy, into the realm of aesthetic, which is conceived in its non repressive use and represents the permanent non-identity between subject and object, individual and individual; this fact can lead the concrete to liberation and autonomy. This exodus or retreatment, therefore, of philosophy serves the primal aim of Marcuse’s philosophical thought that is the real liberation of the individual and the society. In this case, the being of the becoming of this real autonomy of the individual and of this real liberation of the society, which is the Great Risking, is consisted by three plays – riskings: the play between the forces of the metasocial and the social, within the individual, with regard to the relationship between the individual and society, with regard to the relationship between man and nature.